Thanks to 3D printing, the fabrication of prosthetic arms, lightweight EV parts and even space travel have benefited from lower costs of production. Eager to build on that is a team of researchers from MIT’s Computer Science and Artificial Intelligence Laboratory (CSAIL). They’ve built a fleet of self-driving boats that could provide a tantalizing glimpse into the future of autonomous transportation. Unlike the curvature of a regular boat, these 3D-printed boats adopt a rectangular structure — a deliberate design feature which allows them to move sideways, attach to other objects, and potentially, reassemble into floating bridges or platforms for floating music events and mobile food markets. To bring them to life, researchers printed a rectangular hull, and connected 16 different sections together. They’re agile and resistant to force, thanks to four conveniently positioned thrusters, and can smoothly skim across water. Each one measures 4 x 2 meters in size, is fitted with a power supply, mobile and radio frequency beacons, and a WiFi antenna. “Imagine shifting some of infrastructure services that usually take place during the day on the road — deliveries, garbage management, waste management — to the middle of the night, on the water, using a fleet of autonomous boats,” said Daniela Rus, CSAIL’s director. Apart from minimizing traffic congestion, another inherent benefit of the 3D-printed boats is in their autonomous nature; transportation that requires human control can be operated independently, and potentially reduce water-related accidents. There’s still work to be done before these boats hit waterways — the team acknowledges that mass discrepancies between people and ferried goods need to be accounted for. Transferring the 3D designs into a real-world situation will require extensive testing — particularly positioning and orientation. 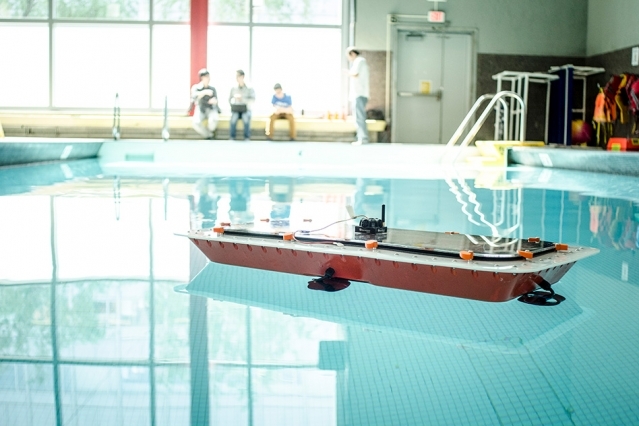 Trials are already being carried out on a small scale, however, the challenge now is to see whether the algorithm controlling these 3D boats will still function accurately as their size increases.